[FT] xDevs.com KX LTZ1000A fairy-tale, or the story of little jumper. Re: [FT] LTZ1000A fairy-tale, or the story of little jumper. If you have such a high noise field that the resistors might be picking some of that up, you should definitely work on reducing the radiated noise field as it could be strong enough to be interfering with the IC's operation as well. Getting rid of noise at the source is always preferred to trying to dampen it out in the circuits you are using. Many sources, such as lamps, power supplies, TVs, laptops, ect., can generate plenty of noise that will be picked up easily several feet away or more and you make a very good antenna yourself. The only source of noise a wire wound resistor creates is normal Johnson noise, anything else is radiated and picked up. Edwin I don't think I have such high noise, I don't have cheap Chinese stuff turned on during measurement and wifi is far away. One of previous KX, the one with LTC2057 was drifting 1ppm by just turning on and off an old linear Agilent power supply (E3641A). This power supply should not produce so much crap to shift reference of 7uV. The one with LT1006 pass this tests with no measurable drift. Only the bench led light seems to cause 1uV to 2uV drift. Getting rid of noise at the source is always preferred to trying to dampen it out in the circuits you are using. I'd like to build some circuit that I can send to calibration lab, I can control what is turned-on in my lab, but I cannot control what is turned on in the cal lab. Having a circuit that reject this noise is fundamental to me ... I think 1uV susceptibility is acceptable and maybe inevitable, but if we are on the 1 ppm range this can be a notable source of uncertainty. So I removed the buffer for now and got of video of the "Phenomena" with my setup. Wire is 30cm long copper twisted pair directly connected to 3458a binding posts (so we can exclude it's thermal EMF). >> yet I don't recall any mV-level changes like you mention from past tests. Yes never mentioned this because I discovered this problem with swapped leads just few days agoo. mV changes is with unbuffered version on the K2001 and long wire (more than 1m). I take the following video with very short wire (same 30 cm) and Keithley. Even with short leads drift is still 300uV and also noise become way worse. Counting on what you can see on the video I can say few uV p2p with straight leads (as by Keithley specs) and sort of 100uV with swapped leads. Here you'll find some photos of the PCB. In this last sample I used through hole components because I only planned to build one KX so I brought only one BOM few months agoo. Anyway despite this the same problems where experienced also with fist sample where I used (almost) all components as by part list on TiN KX article. the one connected at the 70K resistor nodes, CAP FILM for the other lower values and electrolytic for the three high values (47uF). Just a side note - board should not be flying around like that, you just asking for trouble and cannot honestly expect any ppm-level accuracy in such test conditions. How about putting board in a small metal box (fixed with foam, not flying freely around)? Tin can from cookies will do, no need anything fancy. There is still quite a bit of work required to make bare LTZ reference circuit board into robust box like 732A/B, which you can ship anywhere. EDIT: Uploading video now . You guys make me work! TiN fist KX I put inside this metallic box, with some foam to dump temperature changes. Foam was covered with capton to prevent leakage as foam can touch some grounding points (you can see some photos on previous post). I removed some paint from screw-holes to ground all enclosure ... but even this does not worked. 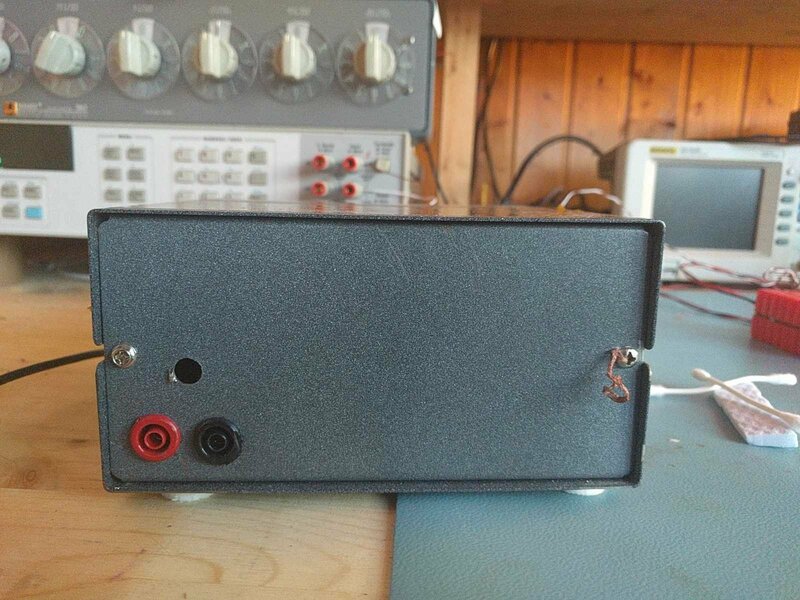 This box has also a LTC2057 buffer, a 15V regulator, fuses, ferrite beads at power supplies cable, ferrite beads at the binding posts cables, etc etc. But all this was useless and didn't fix this "phenomena". Well it seems pushed on TiN 3458a, but it was/is not on mine. Anyway this isn't the first reference I do this test and they always show 1ppm circa of difference not 30ppm. I've tried today a reversal on my LTZ1000 reference in the lab, connected to the HP3458A by about two meters of a screened twisted pair cable, the screen is connected only to the Guard terminal on the HP meter. The meter is on a different bench (hence the long cable). 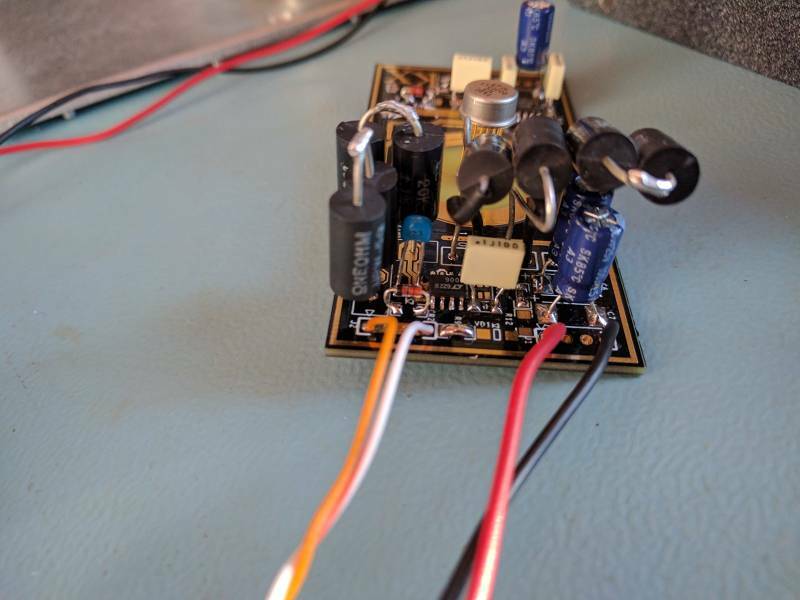 The reference is built on the AD5791 1ppm DAC evaluation board from AD. It is unscreened, the board is sitting in the open with only some bubble wrap around it, supplied from a bench PSU. I could not reliably detect any difference in reversing the leads, positive and negative values were the same down to ~1-2uV, in the noise of the system after some small thermal variations settled. I know that my LTZ1000 reference is not ideal (I have a tempco ~0.5-0.8ppm/C due to some cheap SMD resistors used, only the 110 Ohm current setting resistor is a decent WW Ultrohm), but there is no instability, no problems with the polarity reversal and no "jumps". Very quiet though not very temperature stable. Few updates on my third KX. I added back the buffer using the same schematic that Andreas posted, plus I added a 1k resistor and a 100nF cap between the zener out and the buffer input. After 1 week and 200 hours ~ of operation it's still stable at 7.13366. If we add a further digits its 7.133662 and this 7.133662 was the initial Vout it stabilised the first day (when the reference was enclosed in the foam). If we stretch a little bit my measurement results with the 3458a, the max delta V measured during this days using: same leads, same power supply and a delta temperature not more than 5°C was not more than 0.2ppm. So if I don't change the measurement conditions this slapped together sample seems enough stable to the point I cannot reliably measure any drift with equipment I have. Kinda puzzled now ... never wanted him to survive more than few tests, but it's alive and until it will show to be stable under controlled conditions it will survive. TiN any news about explanation of the drift? In case I shown on video it was a ground loop problem. 3458A, gpib cables network, other equipment are making a path for ground currents, which easily upset sensitive direct reference output. Keithley 2304 is particularly bad in this point, as it's has very weak isolation to earth. If you can repeat reversal measurement with battery (even just two 9V square cells with do fine for quick test) and reversal errors gone - same case for you. It should not be a DC ground loop problem: The DC output impedance of the LTZ1000 circuit is very low. The OP in the LTZ1000 circuit already make it a kind of buffered output, capably to drive several mAs of current if needed. Output resistance is mainly given by the wire resistance and thus is more in the 100 mOhms range. Thus is would take a substantial (e.g. upper µA range) DC current to cause such a large error on reversal. In this loop there both the isolation of the supply and the 3458 are in series. So even a grounded supply would not be a problem. The problem is more an AC ground loop and sensitivity to EMI. Also capacitive loading to the output is different. The LTZ2057 OP is much more EMI sensitive than the LT1013/LT1006 and also possibly sensitive to output capacitance. 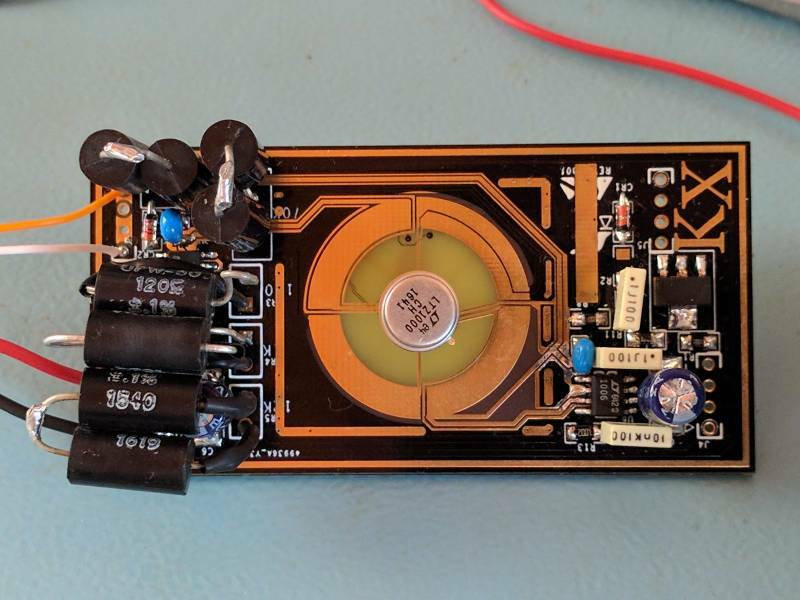 How is the capacitive loading is different, as same board and connections used in both battery-powered and PSU powered cases? When battery powered there is a low capacity from the supply side to ground, whereas the mains powered supply will have a considerably higher capacity to ground. The capacitive loading seen by the reference output has two parts: the obvious one is the capacity between the DMMs inputs - this does not change. The additional one is from the reference output to ground (especially that of DMM input to PE) in series with the capacitance of the supply side to ground. This changes if you swap the DMM inputs. The long wires to the lab supply and the lab supply itself can introduce some RF noise and background to the capacitive ground loop. So things should be worse with the ref + connected to the negative input. What happens if you don't use twisted pair - is it worse? What about using ferrite beads/chokes on the leads going to the meter? For another data-point (ie maybe unrelated) I have/had significant emi issues with my ltz1000 - both breadboard and basic pcb implementations. I varied my design from the datasheet and used dual-rail op27 and not the ltc1006/13. I wondered if there might be something in the choice of op-amps - and if the r2r input/output stage of the lt op-amps might help supression. Things that somewhat helped (or reinforced the conclusion of emi) - was removing the signal diode on the output of the op-amp that ensures positive output for zener startup. I suspect it has some influence as an RF rectifier and added a varying output bias. Also, isolation in a metal can. OK ... taken some more measurements and get still inconsistent results. Sometime things get better, sometimes sensibly worse. For example some days ago I checked reversed output with batteries and it was OK.
Today I have drift and instability even with batteries, there should be something different I do that screw up. 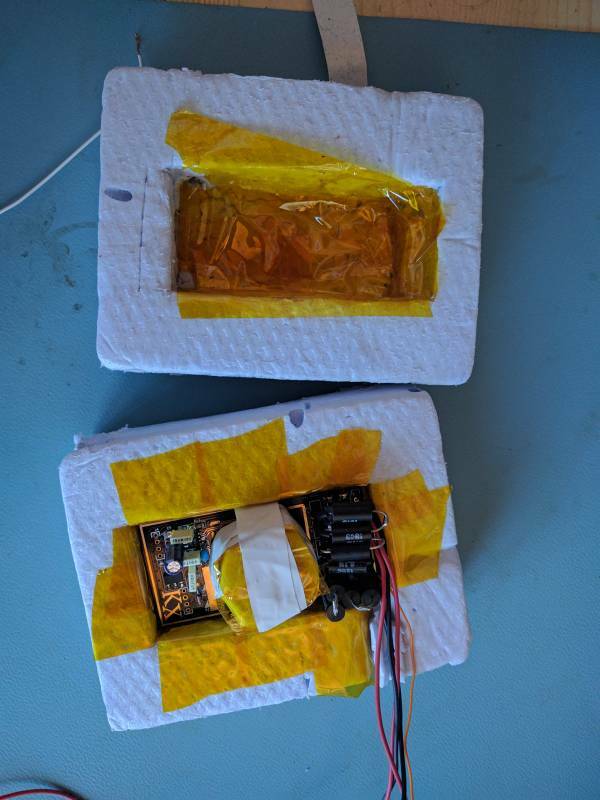 If I put battery pack on the antistatic mat with reversed connection I have the problem. If I move battery pack away no problem even with reversed connection. Generally anything that touch antistatic mat (included shielded leads) screw the things few ppm. This explain also why I had so inconsistent measurements during last two months. I already checked grounding of the mat (was 1M ohm), outlets and instruments and it was ok. I will do some more checks when I back to lab this evening. The diode at the output of the driving OP should add little more sensitivity to capacitive loading, but not much. At a DC current of about 5 mA the effective resistance of that diode is only about 5 ohms. The LT1013 does not have such an unusual input stage (only single supply, not rail-rail). If at all the low bias output stage could be a problem, but with the 5 mA of DC current it is working as a class A stage. One possible measure to improve EMI and load capacity tolerance might be an RC (e.g. 10-100 n and 100-220 Ohms) element to GND at the output. A ferrite bead could be a good idea too. The LTZ circuit from the DS is made for an instrument internal reference, not really to drive an external output and thus handle capacitive loading, possible ESD and RF noise. Also remember that to much load, so that the voltage drops well below 7 V would cause the heater to go for a higher temperature and this way possibly upset the reference and possibly even cause permanent damage if there is no sensible limit to the heater current. The OP27 and similar OPs have quite a high current noise and also bias drift and are thus not the best choice for a high source impedance (about the typical 70 K resistor). away from grounded mat I always get consistent measurements. that I tested KX without any of this part touching it. the same output +/- 1uV. identical as with batteries and also reversed leads test produces the same and stable Vout. now by using normal lab equipment and appliance is just 0.5uV. Excellent!. 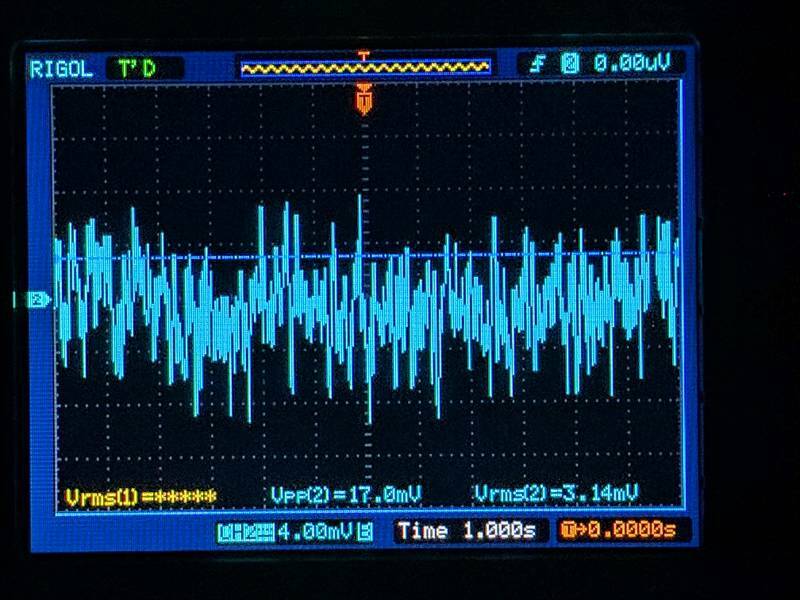 I bodged in a low-pass filter immediately after the diode R=100, C=100nF (I think that's a cutoff of 15kHz). Waving my hand over the unshielded board used to produce a 500uV output change. It's now very difficult to detect anything that could not be attributed to air circulation. The 12k/1k temp-set resistors are currently non-tempco ones so I'll wait to replace those before doing more tests. It really deserves a better pcb with gnd returns at this point. The LTZ circuit from the DS is made for an instrument internal reference, not really to drive an external output and thus handle capacitive loading, possible ESD and RF noise. The only capacitive load I am aware of is the multimeter probe tip/grabber and front-end circuitry. Thanks, I followed your previous advice on this, and they were replaced with opa277. It only takes a few 100 pF at the output to upset the LT1013. The typical LTZ1000 circuit can be even more sensitive than the simple times 1 impedance follower. A DMM can have a significant input impedance, so is a certain length of wire. Even if not oscillating extra ringing from externally injected noise can cause trouble. The 100 Ohms and 100 nF not only function as a filter, they also represent a significant load to the OPs output and this way reduce the gain a little. This helps to improve stability at high frequency. Some amplifiers use this to stabilize the output with difficult loading. I remember an instrument (Lockin amplifier) which had just an OP to drive an output, that could not even tolerate an 2 m coax cable on that output. So it's time to show you some data with this KX003. Reference (or 3458a) has drifted up 0.3ppm since first day but it's still stable. I run a 12h stability test, trying to keep temperature constant except my Daikin as a strange concept of constant temperature and it drifted 1°C in a day. Notice there is some drift due to temperature, this should be 50% due to KX TC and 50% due to 3458a TC. I never noticed the LT1013 being that sensitive to capacitive loading but at the end of Linear Technology application note 148 is a description of how to use an RC snubber on the output of an operational amplifier so that it can handle a capacitive load better; set R to the reactance of the load capacitance at resonance (measured) and the reactance of C to like 1/10th of that. If the load capacitance is poorly defined, then add a shunt capacitance to swamp it out. So today my KX reference gets one month old. Measurements drifted +1ppm in respect to my 3458a since day one. Also other two LTZ1000 references has drifted +1ppm in last week so I think this is most probably due to some hysteresis of my 3458a than the drift of the references itself. As bonus I enclose also here the noise floor of the KX reference + the buffer (thanks to Andreas for sharing the schematics, booth of the buffer and of his 10000x preamp). Considering my setup I think it's in spec with 1.2 to 1.4 uV p2p noise.